In episode #5 of All About the Gear, Frederick Van Johnson and I discuss the Sony RX1R. The RX1R is an awesome little camera, which I very quickly learned to love. After the Leica M-series, it’s the second full-frame mirrorless digital camera on the market. Should you rush out and buy one? No, because I think Sony is about to release even better options. Let’s start with the basics. Announced in June 2013. 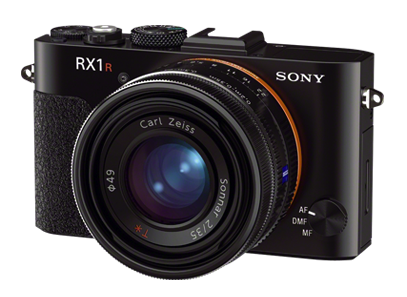 The previous RX1 was announced in December 2012. The “R” model has no anti-aliasing (AA) filter. External EVF (US$479) fits into hot shoe. I just love the sensor in this camera. I like it even more than the Leica M240 in low-light/high-ISO situations. While it may not have the warmth or that special “Leica look” that you get when you mary Leica lenses to Leica bodies, the RX1R has excellent color, tonality and dynamic range. But what I found so unusual about this sensor is its noise. You know how high-ISO noise usually looks. I call it confetti. It’s sprinkled with red, green and blue pixels. This is far less pronounced in the RX1R. When you crank up the ISO, you do get noise, but it’s far more attractive than the usual noise. It even looks a bit like film grain, particularly in black-and-white images. In fact, this is a particularly good low-light b&w camera. 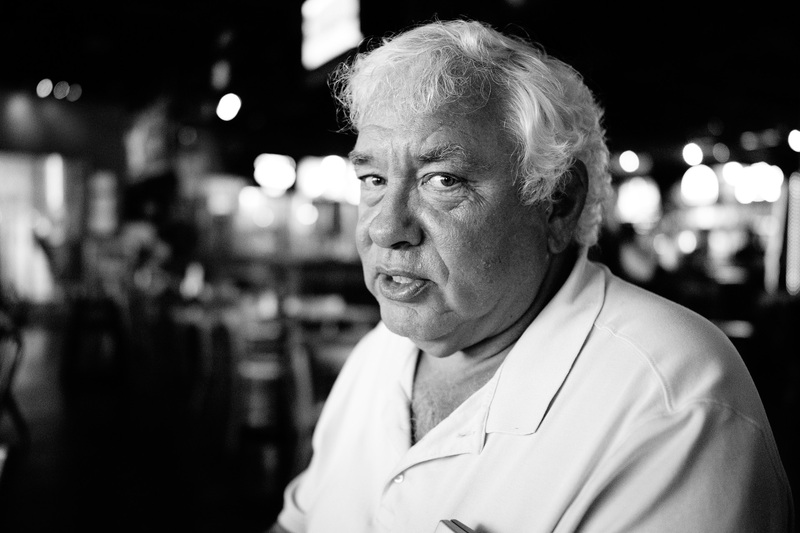 Here’s a straight-out-of-camera image I shot of color-correction guru Dan Margulis in a San Diego brew pub. ISO 8000, 1/250 second, f/2, +1.3EV exposure compensation, in-camera JPEG with b&w high-contrast preset. The only difference between this camera and the previous RX1 is the removal of the AA filter. This has become a trendy thing to do to high-resolution digital cameras. An AA filter introduces a very slight blur to minimize the moiré effect when shooting typically man-made repeating textures such as fabrics and some architectural details. Removing the filter makes the camera more prone to moiré, but makes the resulting image very slightly sharper. On my Nikon D800E, which also has no AA filter, I have a great deal of trouble seeing the difference from the D800, which has one. But the fact is that there is a difference, and you can see it when shooting with a very sharp lens such as the Zeiss 35mm on this RX1R and looking at your images 1:1 in Lightroom, etc. Still, printed 1:1 at 240dpi, an image from the RX1R would be 25″x16.7″, so you’re not going to see the difference in smaller reproductions or online images. And as far as the moiré problem, (a) it’s hard to create or find, and (b) applications like Lightroom can do a good job of filtering it out in post-production. The RX1R is solid. It feels great in the hand, similar to a Leica M9. It feels more “serious” than the Fuji X100S. Even the lens cap is hefty and seems to be a combination of metal and plastic. Clearly, Sony is making a statement with this lens cap. The controls are just about perfect. You’ve got the usual PASM dial on the top surrounded by a rotating ring for shutter speed. Also on top are a dedicated exposure compensation dial and a small configurable button, which I use as a shortcut to setting the ISO. Aperture is controlled by a faux-manual ring on the lens that has 1/3-stop detents. Auto/manual focus is controlled by a knob on the lower-left (as viewed from the rear) corner on the front of the body. I do wish it was a bit easier to turn, perhaps with a short lever extending from the knob. The AEL button on the rear can be configured for “rear-button focusing” fans and works well in that mode. The 3″ rear LCD is bright and beautiful. Unfortunately, it doesn’t articulate. On one hand this makes the camera feel more solid and probably keeps it a bit thinner, but I really wish it would at least articulate on one axis for shooting from low and high perspectives. I’ve long complained about the menus on Sony cameras. They’re just awful on my NEX cameras, for example. But the menus on the RX1R couldn’t be more different. They’re great. The design is a simple x/y structure, with the added advantage that you have the choice of bypassing the horizontal (x) axis and simply scroll through all of the options on the vertical (y) axis. Very effective and far more logically organized than on past Sony cameras. The camera starts up quickly and feels very responsive. Overall, it’s a great camera from a usability perspective. The Zeiss 35mm f/2 is gorgeous. As mentioned above, it has 1/3-stop detents. Unfortunately, because the aperture is actually set electronically — the aperture ring is really just an input to the processor — there are no hyperfocal-distance markings. As far as sharpness, chromatic aberration, etc., I’ll leave the quantitative details to the more-technical reviews. But I found the lens to be one of the sharpest and cleanest I’ve ever used. The out-of-focus bokeh is also excellent due to the nine-blade iris. It’s an outstanding lens. You can switch into macro mode by simply rotating a ring on the very front of the lens. I found this to be an excellent macro lens, particularly for hand-held closeup work. You just get as close as you can in normal mode until you can’t focus, then switch into macro mode and keep going closer, down to 0.2m. Very simple and intuitive. The specs for the camera state that it has optical image stabilization, but I wasn’t able to detect it and there doesn’t appear to be any way to turn it off or on. On the other hand, I never felt I needed more stabilization because of the fairly wide 35mm focal length. ISO 800, f/4, 1/80 second. As is common for mirrorless cameras, the autofocus system is contrast only, without the advanced phase-detection sensors found on high-end DSLRs. But I found the autofocus to work quite well on the RX1R. I never felt it was inadequate. In fact, thanks to focus peaking, which has become a go/no-go feature for me, I probably focused manually more often than I used the autofocus. My favorite method is to set the camera for manual focus then use the AEL button to focus the camera. This gets it close, and then I get it just the way I want it using manual focus. When focusing manually, the camera will (optionally) zoom in to allow for more accuracy. Very effective. And the focus peaking is as good in this camera as any I’ve used. The metering/exposure system is also quite good. I felt it judged scenes about as well as my newer Nikons. At this point, metering in most cameras is so good that I tend not to notice it unless it’s really sub-par. I find myself using AUTO ISO more and more on most cameras, and I’m very aware of how the camera makes its ISO decisions. The RX1R does this very well. It tries hard to keep the shutter speed at 1/80th second or faster before pushing up the ISO, and this is the right decision for a 35mm lens with a high-resolution sensor. Because of the large sensor and rear LCD, I don’t think Sony had room to include a built-in EVF without enlarging the body. For me, personally, that’s a problem. Although I love using the LCD for those down-low and up-high shots, at eye level I much prefer a viewfinder. In bright light it’s an absolute requirement for me. Sony solved the problem (to some extent) with an optional (US$479) EVF that plugs into the hot shoe. I’ve got other cameras with lenses that cost less than that! The EVF tilts up so you can look down into it, but of course you still have to hold it up to your eye. I’m not impressed with this EVF. Someone wrote that it’s the same as in the NEX bodies, but I don’t think so. I find its field-of-view to be too narrow, while at the same time I can’t get close enough while wearing glasses to see the whole image clearly, even with the eyecup removed. In some ways this is really a technology-showcase camera for Sony. I’m not sure they expected to sell a lot of them. With external viewfinder, it costs US$3,277. True, that includes a great lens, but it’s substantially more than a Nikon D600 with a very good lens included as well. And when you consider that Sony doesn’t include a battery charger and wants US$180 for a lens hood — that’s right, no lens hood is included either — you start to see the company’s attitude towards this camera. Maybe they’re also testing the waters to see what the Leica-level market would be like for them. Leica is certainly a brand that offers very high quality at even higher prices. If you want a camera like the Sony RX1R (fixed 35mm prime lens, mirrorless) I recommend the Fujifilm X100s. Although it has a slightly smaller cropped sensor, the X100s delivers nearly the same quality for less than one-third the cost if you include the viewfinder, which the Fuji has built-in. In some ways (such as the inclusion of a three-stop neutral-density filter and a superior EVF) the X100s is an even better camera and it’s a joy to use. In any case, as I wrote at the start of this review, things are about to change in Sonyland. So don’t rush out an buy this camera even if you can afford it. Within 30 days, I expect we’ll see something even better. Doug that is a standard menu for Sony Alpha cameras, I wish they used it on NEX cameras. There is electronic stabilization for video only. I searched for a Long time for a full-frame “old-style-but-latest-Technology” camera with a fixed Focus. 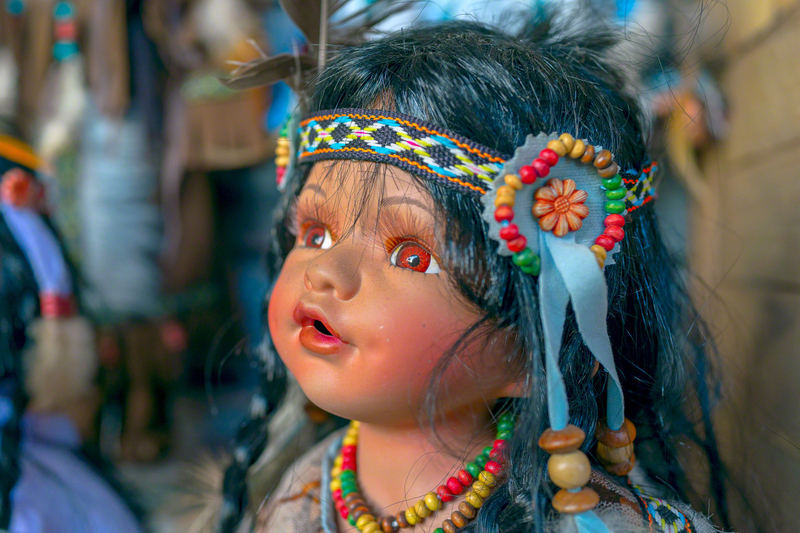 I still love my Nikon D700 and all the – heavy – lenses, e.g. the 24-70 mm; 70-200 mm etc. . But for traveling and easy-going situations I finally found the Sony RX1R. It´s a different peace of cake than the Fuji x100s; at least for those, who value the full frame chip. However, one thing missed, and this was the “chocolate” case (half-case) from Ulysses, which I just found by strolling around in a camera shop in Kyoto/Japan …. it is a MUST have; together with the Sunsniper-pro camera strap it is the top of the top solutions for street photography. The latter saved me once in St. Petersburg from loosing my D700, since someone tried to cut off the strap but failed due to the built-in steel wire.